The smallest of the Solar System's seven planets and the closest to the Sun, Mercury is a barron landscape that pretty much lacks an atmosphere - consequently, the side facing the Sun will be lethally hot, whilst the side facing away will be monstrously cold. The planet, as expected, also has the fastest orbital period of them all - completing a full circuit around the Sun in just shy of 90 Earth days, though it's rotation is so slow that barely two days will pass even after two full orbits. This is result of what is known as a tidal lock with the Sun's gravitational influence, which has gradually slowed the planet's rotation down over time to keep it in sync with it's full orbit. Mercury has a high accolade in the Solar System lineup, however - only behind Earth, it is the second densest planet. It's composition of rock and other similarly heavy materials make it this way despite it's small size (barely bigger than the Moon). It's minor distance from the Sun makes it a hard planet to visit with probes, and so such visits have not been as common or detailed as those with other popular planets. It's lack of atmosphere and dry landscape make it a vacuum where life could certainly never prosper, making it the last place we'd consider a future to thrive. Mercury may be the closest planet to the sun, but it's lack of atmosphere causes extreme temperature variations - the day is scorching hot, whilst the night is hideously cold. Venus, the second from the sun, is quite the opposite - in a sense, it has too much atmosphere, which causes consistent temperatures of around 460 degrees celcius. The surface of the planet is not even visible from the views of probes due to an obstruction of thick sulphuric acid clouds; only 3D scans give us an idea of what's beneath, which is essentially a dry hellhole littered with more volcanoes than any other planet (well over 1000), an atmospheric pressure nearly 100 times as strong as that of Earth, as well as frequent storms with proven existence of lightning and acid rain, though said rain quickly evaporates before it even gets close to the surface. Aside from the Moon, Venus is the brightest object in the night sky; a trait caused by the fact that it is both the closest planet to Earth and because it's aforementioned clouds reflect the majority of sunlight into space. In areas without light pollution, it is often bright enough to cast shadows, and even bright enough to be seen in the early morning and evening daylight in some areas - hence it's morning star and evening star nicknames. 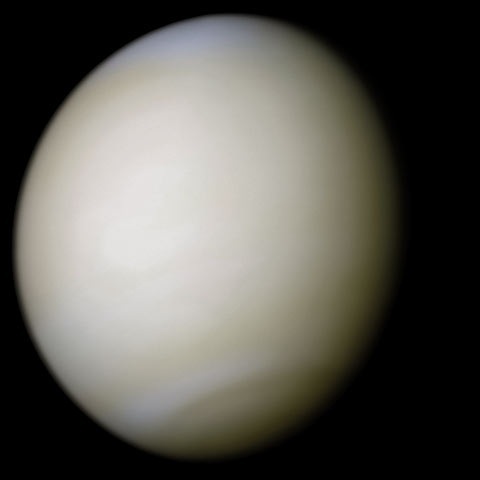 Venus is also known for being the slowest planet in the Solar System when it comes to rotation - it orbits the Sun faster than it rotates on it's own axis, completing a full orbit in 224 Earth days yet not finishing a full rotation until 243 Earth days, technically making a year on Venus quicker than a day on Venus. 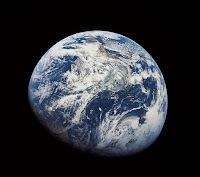 Earth is, of course, the only celestial body known to accommodate life; an attribute that can pinned down to many factors, but the most important is of course known by anyone (I hope) to be it's perfect distance from the Sun. The Sun's heat provides us with a landscape that allows life to evolve and prosper, and another crucial trait of Earth is it's magnetic field - which blocks harmful solar UV rays, permitting the first lifeforms to develop around 3.5 billion years ago; 99% of all Earth lifeforms are believed to be over, something that a number of mass extinctions have contributed to, most notably the Cretaceous impact event that killed off the dinosaurs. Earth now houses over 7.3 billion humans who have divided it's landscapes into hundreds of countries and states housing their own diplomacies, cultures, religions, ideologies, you name it. Scientists believe that we've discovered only one thousandth of 1% of all other extant lifeforms, meaning that dozens of mysteries still await on our age old homeworld. The future of the planet is generally uncertain; but if we ignore all the fears of global warming and other human disruption, it's generally believed that life on Earth will come to an end just under a billion or so years from now when the Sun begins to enter it's red giant phase, where it will increase in luminosity so drastically that the Earth will certainly lose it's oceans and plant life. Where humanity will be by then (if still around) we do not know, but it's amazing enough just how lucky we are to be here when you consider the perfection of the system around our home, and it's something I always feel we never really appreciate. While not the first planet to have man made tech land on it (that goes to Venus), Mars is the only planet that we have explored the surface of in great detail thanks to an environment that, while certainly hostile to any lifeforms, is safe enough for robust rovers to navigate through. It is a world that attracts some of the highest amounts of interest from researchers and has often been hypothesised as a place that could one day be terraformed for human adoption. Rovers over time have uncovered evidence of liquid salt water, suggesting Mars may once have been home to bacterial lifeforms and wasn't always the dry, dusty desertscape it is today. As a volcanic landscape, Mars is home to some of the largest geological features in the Solar System, including Olympus Mons, a 14 mile high shield volcano that's almost as large as France, and Valles Marineris, a system of canyons that stretches for over 2500 miles. Almost half of the planet is home to the North Polar Basin, a smooth basin that is believed to be the result of a catastrophic impact millions of years prior. These features rival and exceed many similar structures on Earth, despite Mars only being half the size - so don't underestimate it at first glance. We have much more to discover on it's surface, and with more and more rovers planned for launch in the decades to come, we can be sure that Mars still holds the answers to some mysteries about whether or not life could prosper there one day. I know it's not a planet anymore, but Pluto still holds such a memorable place in many people's hearts because of it's original title as the eighth planet from the Sun - a trait that lasted from it's discovery in 1930 until 2005, when the term planet received a formal definition that excluded Pluto and left it classed as a dwarf planet, resulting in gas giant Neptune being the new furthest planet from the Sun. A recent surge in Pluto's rep came in July 2015, when the New Horizons probe took the very first closeup pictures of the planet after it's 3 billion mile journey that began in January 2006. These pictures began a stronger understanding of Pluto's general landscape and brought to fruition many of it's key features, notably it's heart-like pattern that's merely a brighter area of land but has become one of it's most recognisable traits - though I myself think it looks more like a whale's tailfin. Insightful research was ignited upon New Horizons' flyby of Pluto, a key moment of which brought to focus that possible life being born from inanimate matter. Whether or not this can be confirmed we don't know, but even in it's brief flyby the probe made many detailed measurements, leaving us with many possible answers to the mysteries surrounding the dwarf planet since it's discovery.